Return Air Grilles don't need to be expensive. Find over 50 different sizes of white return air grilles starting at under $5.00. Great for new construction or when you want to replace grilles. Please remember there are no dampers with return air grilles. We also have Heavy Duty Return Vents that are ideal for heavy traffic areas. There are many sizes available from the hard to find to traditional sizes. Traditional round white return air grilles for wall or ceiling. Please remember, return air grilles will not come with a damper. Made of durable stamped steel, these white return air grilles are available in 6, 8, 10, 12 or 14 sizes. Looking for a matching filter grill? We have a large variety of sizes to fit your needs. These hinged filter grills are easy to install and change filters. 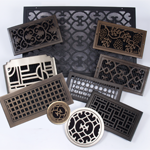 Replace your old white grilles with these new decorative Pewter Return Air Grilles. These plated Brass Return Air Grilles have the traditional look of brass on a sleek grille face. There are no dampers with any of the return grilles. This brass accent is a great way to finish off a room. Classic Grills Returns will add beauty to any space. Made from solid aluminum and solid bronze, these return air grilles will stand up to the test of time. Choose from several designs, colors and sizes. These stunning return vents are crafted from 100% aluminum and feature a scroll design. They can be utilized in both indoor and outdoors settings. The return vents come unfinished and can be painted to match your decor. Pattern Cut Grills are a great option for your wall and ceiling register or return needs. These beautiful wood grills come in 26 different designs and a large variety of sizes. A damper can be purchased separately to turn these grills into registers in a snap. You can also use these grills as cabinet door inlays. Caution: These grilles are not meant to be used in the floor. Round decorative wood vents are available in 25 different designs. Circular are laser cut for precision. Custom round vent cover sizes available. Find hard to locate sizes in a beautiful decorative floor or wall grill. If you don't need to control the air flow, here are the grills for you. 15 Finishes to choose from you are sure to find just what you want. Need a size not listed? These grills are fully customizable. Just call for pricing. Round air vent covers suitable for wall AND floor use! These circular decorative return air grilles have many design and finish choices. Round custom vent cover sizes also available.